The fact that some people call slot machines fruit machines is based on the fact that the first machines created featured symbols that portrayed fruits. They have also been called one-arm bandits because the machines found in brick and mortar casinos were operated by a lever, the arm, on the machine’s side and were believed to cause people to lose a lot of money. These led to the machines to be soon referred to as the “one-arm bandits”. Whatever name we give them today and whether offline or online, most modern slot machines are basically the same. The principle of both is that the game is composed of a number or reels that produce random results. A payout is made when the result is a winning combination. Today, the brick and mortar casinos have a large variety of slot machines, but their variety is nowhere near to the online variety. The theme of the games is what makes them appear so different from one another since the game’s appearance is based on the theme. Fantasy themes have become more and more popular and are the underlying factor of the great variety of slot games. 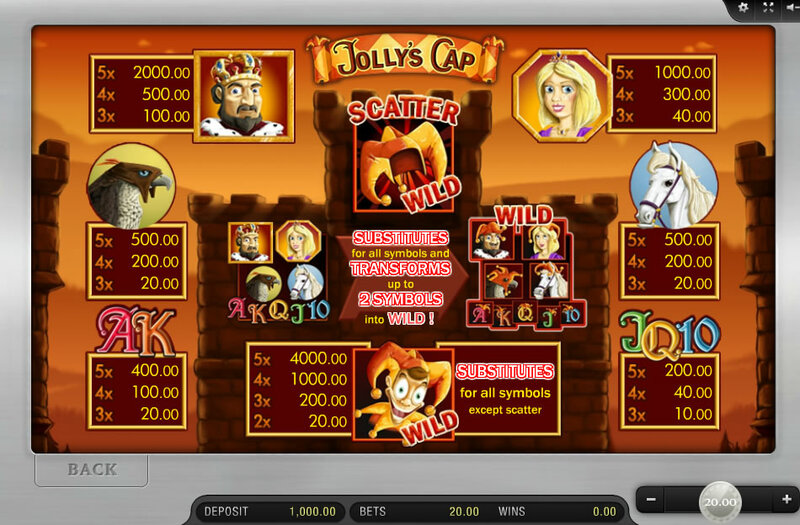 A classic video slot of Merkur Jolly’s Cap, is one of the most popular fantasy slot games of recent times and is only available online. Its popularity is due to its adorable and comical hand-drawn symbols, unique theme, and spectacular animation. During medieval times, slot machines and other forms of gambling didn’t exist, but guests of noblemen and princes were entertained. The entertainment was provided by a member of the household known as the court jester. Court Jesters sang, told stories, performed acrobatics, juggled, told jokes and performed magic. 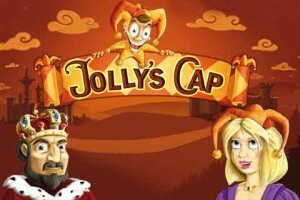 Jolly’s Cap slot game’s court jester theme certainly adds to the fun of playing. Jolly is the court jester of the game. Keeping with the theme, the symbols of the game are based on the times of the court jester. The human characters including an angry and menacing king and a friendly looking princess are high paying symbols. The white horse and the elegant looking hawk symbols have a middle value, and the lowest value symbols are the ring, letter, and number symbols. “Jolly”, the joker, is the wild symbol. As the wild, it can be a substitute for any other symbol to complete a combination to win. However, it can’t be a substitute for the scatter. Unique to this game, the joker’s hat is a second wild as well as a scatter. Thus, it is a scatter wild. By its appearance, it turns one or two other symbols into wilds. When it turns symbols into wilds, the symbols appear with a hat on their heads for the spin. Common to many slot games, this slot has 5 reels and 10 paylines. All of the paylines are fixed and can’t be customized. At the start of each spin, you can set the amount of the bet. The minimum bet is $0.10 and it can be increased as high as $20 for the maximum wager. Before each spin, you can also change the amount of the bet. By selecting the “Max Bet” button as well as an “Auto Start” feature, you can set the reels to spin 100 times at the same bet. 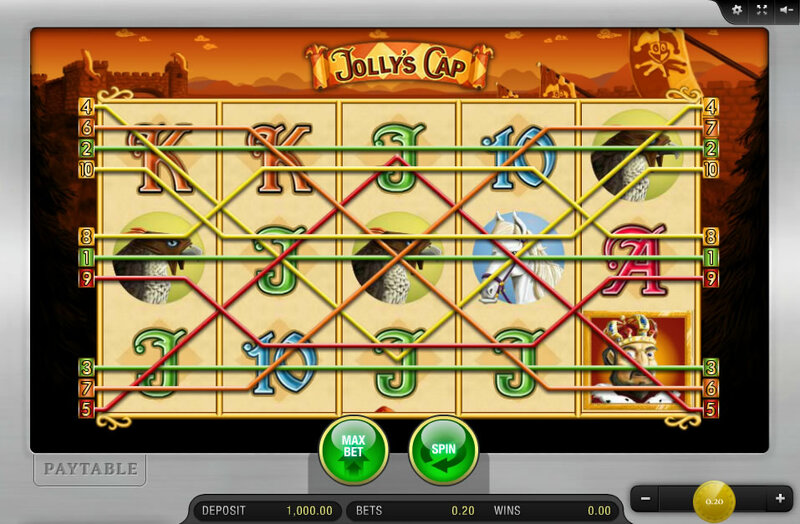 To get a win playing Jolly’s Cap slot game online, you simply have to spin and manage to get at least three matching symbols directly next to one another on a bet line. One special feature is created by the Wild symbol. 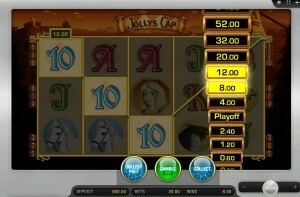 Since Jolly is the Wild, five Jolly symbols appearing on a payline will reward you 4,000 coins. All Merkur’s Wild symbols of slot games usually substitute for any of the other symbols on the reels. However, in this game it will convert up to two other symbols appearing on the reels into Wilds. Another feature commonly found in Merkur’s gaming products is the gamble option. After each of your winning combinations with a less than $140 payout is created, this option is initiated. You then have two choices. One choice could be to collect your money in the amount you have won. A second choice could be to play one of two games in an effort to increase your winnings. The Ladder Game – A ladder with various amounts will appear on the screen. A blinking light will travel between a higher value than your winnings at that time and a lower value. To increase your winning’s amount, you must stop the light on the higher value. You can repeat the challenge a number of times until you have increased your payout to $140. The Card Option – With this option, a virtual deck of cards appears on the screen. If you guess whether the color of the next card to be turned over is red or black correctly, your winnings will be doubled. If you guess incorrectly, you lose all your winnings. 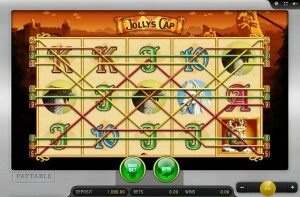 There are many reasons why trying Merkur Jolly’s Cap slot game with SlotsClub.com will be an experience you will thoroughly enjoy. Its unique theme presenting comical court jesters is one that will certainly amuse you. Even the game’s symbols that are artistically hand-drawn and marvelously animated are out of the ordinary. Above all, its features will help you to be successful at winning more cash if you’re playing with real money. In addition, there are several sites online where you can play this game just for fun for free.